You can hire bikes in the Creuse with Bike Hire Direct! BikeHire Direct make it easy for you to rent bikes in the Creuse - there is no need to have the extra hassle of transporting your own bikes... let us know where you are staying and we will deliver bikes directly to your holiday accommodation ready for you to enjoy on your holiday! 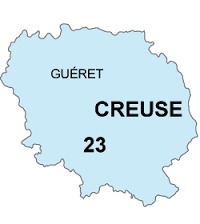 The Creuse is part of the Nouvelle Aquitaine region. It is a lightly populated region with untouched landscapes, and many heritage sites. The lovely town of Gueret is the largest in the region with a population of just 14000, and there are several other seemingly untouched gems in the region such as Bourganeuf, Aubusson and la Souterraine. We are currently researching cycle routes in the Creuse region. In the meantime if you have any queries regarding your cycling needs in the Creuse, please contact us.